There was a time when parasites like fleas, ticks, and roundworms were considered mostly a nuisance. Now we know that parasites can cause serious illness and even death in pets. For example, ticks can transmit infections like Lyme disease, and fleas can transmit tapeworms and Bartonella (the bacteria that causes "cat-scratch fever" in humans). 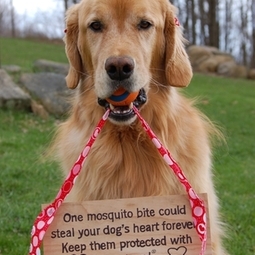 Another type of parasite, called a heartworm, is transmitted by mosquitoes. Heartworms live in your pet's lungs and heart, causing damage to these organs, and sometimes even death. Intestinal parasites, like roundworms and hookworms, also threaten pets and are even transmissible to humans. Click Here to learn more about parasites. PREVENTION IS KEY! We have a well-rounded selection of topicals, collars and chewables that provide protection from fleas, ticks, heartworms, ringworms, hookworms, mosquitos, and now tapeworms. Click Here for tips on applying parasite preventatives to your pet. The medications purchased through a veterinary clinic have an additional layer of a manufacturer's guarantee that medications purchased at non-vet retailers do not. We also have access to many different promotions that allow us to be cheaper per month than other online retailers. We also have the expertise to help you choose the right combination for you and your dog from the overwhelming choices that are out there.